Recent (Q2 or Q3) financial results have been a mixed bag for the industry. Video revenues have consistently declined on a YoY basis for most operators including Intelsat, Eutelsat, SES and EchoStar Satellite Services, while most operators have posted gains in network connectivity – most prominently in Government and mobile connectivity verticals, including ViaSat. To say that the latter two verticals remain the growth story in the near term is a massive understatement – while one must also take into consideration significant progress in consumer broadband by Hughes and in mobile backhaul by SES (MEO). Though, barring equipment sales by the top two integrated operators, overall growth looks to be lagging in 2018. Many satcom operators seem to be missing targets, especially on video, with capacity prices continuously falling even in developed markets of the world. 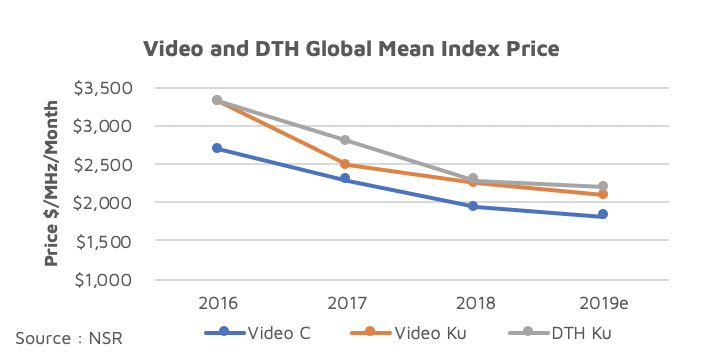 There is likewise high regional competition, as well as the terrestrial pressure, and given that video still forms the bulk of the GEO industry revenues today, overall growth is stagnating in the near term. There are certain key indicators covered under NSR’s Satellite Industry Financial Analysis, 8th Edition, that present unique patterns that can be deciphered to predict the future state of the industry. 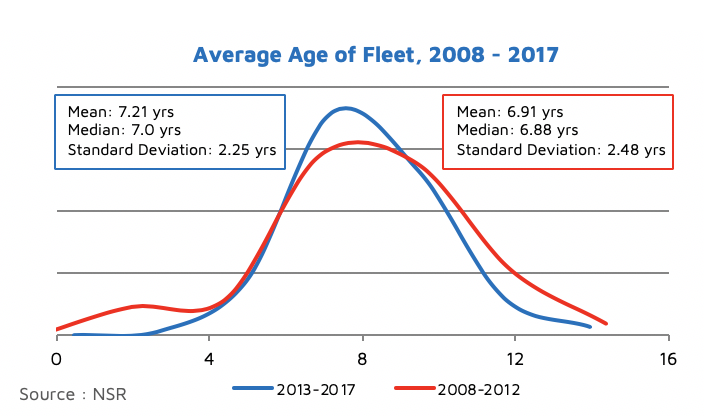 Satellite Age: The average age of a satellite is increasing, and as well, becoming more predictable as technology is standardized. This trend is expected to continue in GEO orbits, while more flexibility in operating frequency and beam shaping may be added. Due to this, replenishment cycles are becoming longer, with older GEO satellites replaced by fewer, more efficient ones. 2. Lease vs. Service Business: Lease revenues are consistently decreasing across the spectrum of big and small operators, barring a few like Telesat. With non-video revenues increasing – with high pick up rates in Govt business, IFC and backhaul – the industry reliance towards network and service-based revenues has become apparent in 2018. With most major service providers posting high single-digit to low double-digit growth, the next tussle will be between achieving high EBITDA sustainability vs. selling off the business to the highest bidder. 4. Capacity Supply, CAPEX Requirements and FCF Dogma: Supply continues to increase in the industry, with several regional players replacing older fleets, and global players betting on new connectivity markets via IFC, backhaul and broadband. The interim CAPEX cycle is expected to end in 2020, with Free Cash Flow peaking in the industry around 2020-21, resulting in debt payoffs, payments towards non-GEO constellations, introduction of new network products or finally increased M&A activity. 5. Big vs. Small Operator Trends: The business models of regional operators became more bipolar in 2018 – as some choose to consolidate EBITDA above 80% in the traditional FSS business, while some chose to invest heavily in renewing the fleet and bet on new verticals like consumer broadband. Barring a few operators, most seek a piece of the service revenue pie in the long term to sustain/grow revenues. For bigger operators, there is a lesser reliance on video while smaller operators hold more commanding positions in their incumbent region. Fill rates too indicate a bias here, with smaller fleets expected to show better performance in the near term. 6. Years of Backlog to Revenues: This ratio indicates falling backlog over the past 5 years, with most indications of at least a 5% CAGR decline over the next 5 years – as the industry pivots from the standard lease model to shorter contract lease/service models. Fewer long-term agreements are signed today, and the ones which are, command a low wholesale price – thus further declining the backlog. Given this indicates a larger risk on a 15-year business model, operators are expected to compensate with higher rolling over business via increasing distribution partnerships to compensate for regional downturns and competition. Most operators strategize to optimize for the highest revenues per MHz capacity in orbit, and thus prioritize the verticals they must serve. This strategy becomes ever more important with stagnating growth in 2018, with marginally extra video demand, decreasing pricing and backlogs. With many operators highly leveraged and compromising ROCE, return to standard 5% average growth on capacity and managed services sales looks to be delayed in the near to medium term. Increase of FCF towards end of 2020 should provide a boost of investment into new applications – unbundling vertical specialization to an extent alongside M&A to achieve economies of scale. In the meantime, integrated operators and service providers look to achieve higher growth, with focus slowly shifting towards stabilizing EBITDA margins. Thus, expect a higher degree of strategic partnerships resulting into market access and eventually M&A, that stabilizes price post 2020 and gives a higher return on capital invested.